I’ve been a fan of the Muppets for a very long time. 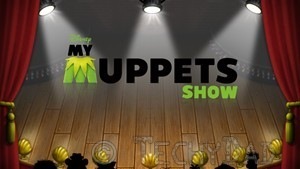 When I was a kid, I used to love watching The Muppet Show on TV. Then there were the many Muppet movies. They always promised some hilarious, slightly out-of-control fun. After that, I would regularly watch Muppet Babies and awed at how the Muppets – as little kids – would have amazing adventures. (I just wish Muppet Babies was available on DVD or on Netflix. My kids would love it.) Recently, we all fell in love with the Muppets again with their movie and their YouTube shorts. 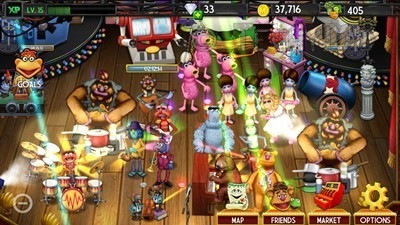 A week ago, B found out that there was a new game for Android phones: My Muppet Show. (Apparently, it had been available for iOS for awhile but just made the Android leap.) Within minutes, it was installed on B’s phone, JSL’s Galaxy Tab 2, my phone, a spare Android phone that NHL uses for gaming, and our iPad. The boys and I were hooked instantly and soon the sounds of Muppet performances were echoing through our house. 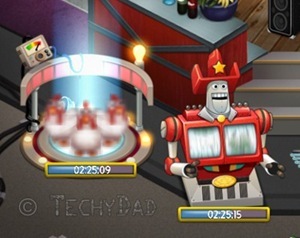 The premise of the game is that Dr. Bunsen Honeydew has come up with a new invention – the Digitzer. Using this, he can transport Muppets from the real world to the digital one. You transport Muppets to your digital stage, but it isn’t glamorous to start with. Instead, it’s run-down with garbage strewn everywhere and cramped, tiny dressing rooms. Thankfully, though, it doesn’t stay that way. As your Muppets perform, they earn money. Money can be used to remove trash, buy dressing room upgrades, and purchase various enhancements. 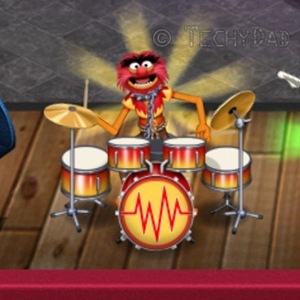 Some of these enhancements will make your Muppet performers happier. And happier Muppets earn you more money. Money can also be used to buy food which – when fed to your performers – allows your Muppets to increase their level which, in turn, means they earn even more money. Along the way, your various actions (including completing tasks assigned to you by Scooter) gain you experience points which unlock more characters and enhancements. You can even become friends with other players and visit their stages to see what they have and how they arranged their performers/items. You can get friends via Facebook, Twitter, or e-mail. In a stroke of genius, you can also just enter a person’s friend code to add them as a friend. (You become their friend as well automatically.) This is so simple that NHL discovered this feature the second day he played it (before I found it) and he set it up so he and his brother were friends. This game is very addictive. 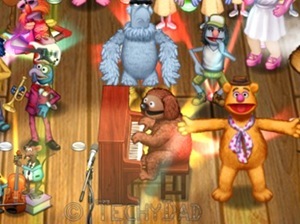 I can’t stop playing it and love seeing all of my Muppet performers strutting their stuff. I love watching the Digitizer slowly forming a new Muppet and hoping it is the one I was trying to get. (Dr. Bunsen Honeydew’s inventions aren’t 100% reliable.) By the way, my friend code is 777218FE. If you get addicted to the game the way I and my boys have gotten, feel free to let me know and add me as a friend. I’ll stop by your stage to see how your Muppet performers are doing. 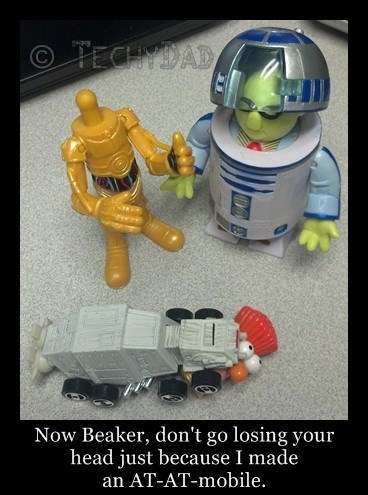 Coincidentally, the teaser trailer for the Muppets’ next movie was just released yesterday. This looks like it’s going to be tons of fun. I can’t wait for spring 2014! The other day, we were driving and the subject of NHL’s birthday party came up. He had wanted a Muppets themed party, but switched awhile back to Harry Potter (inspired, no doubt, by the fact that we’re reading the series together). Then, when the difficulty of making Harry Potter cupcakes became apparent, he reverted back to Muppets. As we went back and forth, I jokingly suggested putting Harry Potter glasses on the Kermit cupcakes to make Kermit Potter. We laughed and then ran with the idea. Mrs. Piggy would have to be Hermione Granger, of course. Slightly hapless, but well meaning Ron Weasley would be best played by Fozzie Bear. Meanwhile, completely hopeless Neville Longbottom would have Beaker taking his place. Hagrid was an easy pick: Sweetums (the large, brown, hairy Muppet perhaps best remembered for running after the other Muppets in The Muppet Movie after being mistakenly left behind). We couldn’t decide on who should play Voldemort, but I voted for Gonzo. (He’s done villains before since he’s Darth Vader in the Muppets Star Wars sets that Disney sells.) Of course, he’d be Weirdomort with a huge shnozz instead of serpent-like slits. As we debated this, NHL had a stroke of genius. The Dementors, he declared, should be Gonzo’s chickens. (Instead of the Dementor’s Kiss, the Cluckmentor’s Peck?) Mind you, NHL is still on Prisoner of Azkaban so he doesn’t know how the Dementors will align with Voldemort. We’re still conflicted who Dumbledore should be. Jim Henson is a big possibility, but I think he should be a Muppet figure. It would have to be a "wise" figure to which Harry…. I mean Kermit Potter goes to for help. Maybe Dr. Bunsen Honeydew? The identity of Severus Snape was another problem until I stumbled upon a site that did their own Muppet-Harry Potter mashup. (Sadly, I’ve lost the link to that site.) Snape is a proud individual who sees himself as better than rabble like Harry and his friends. Thus, Sam the American Eagle is perfect for the job. Lupid was an easy pick: Rowlf the dog. For Dobby the House Elf, we chose Rizzo the Rat. Finally, Professor Trelawney was thought of as the Swedish Chef (even though he’d be playing a female character), but then I figured that Janice would be a better fit. 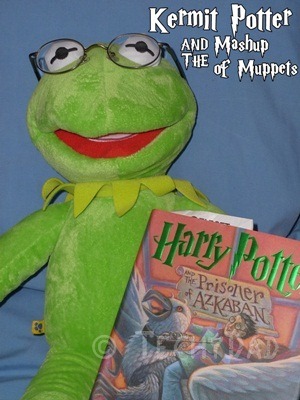 What Muppet would you cast in a Muppet-Harry Potter mashup and as which Harry Potter character? On Saturday, we headed out to the movie theaters. Our waiting was over. It was time to play the music. It was time to light the lights. 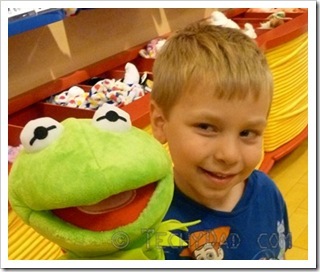 It was time to meet the Muppets on The Muppet Show… I mean, the Muppet movie. The movie opens with a montage of scenes of Gary and Walter growing up. As Gary gets taller, Walter remains the same height year after year. Of course, Walter also looks a little bit different as he’s a bit fuzzier than a normal human. One might say even a bit felt-like. Walter’s woes over being different subside the minute he sees the Muppet Show on the television. From that moment on, he’s hooked. He’s the Muppet’s number one fan. Fast forward to the present and Gary and his girlfriend of ten years, Mary, decide to take a 10th anniversary trip to Los Angeles, California. Gary surprises Walter by telling him that he’s coming too to see the Muppet Studios. A musical number later and they’re on their way. Oh, yes. There are musical numbers. Characters and extras will just burst out into spontaneous song and dance numbers. My boys and I had heard much of the soundtrack earlier, so we knew what to expect once the music began. Or at least we thought we did. The music took on a whole new light once we saw it in context. Back to the movie, though. Gary, Mary, and Walter find Muppet Studios all but abandoned. Apparently, the Muppets went their separate ways a long time ago and people have forgotten about them. Walter stumbles across a plot to tear down the buildings and drill for oil. It’s up to Gary, Mary, and Walter to find Kermit, gather the Muppets back together for one last show to rescue the theater. Along the way, they have to decide what is really important in their lives. My boys loved it. They were singing parts of the soundtrack for the rest of the day (and requesting that I play them the MP3s after that). I’m still laughing over cameo appearances and over jokes. It was all that a Muppet movie should be. There was fourth wall breaking (After Kermit declines to help save the studio, Mary comments “This is going to be a short movie.”), call backs to their previous movies (as they are gathering Muppets together, they drive past a used car lot out of which Sweetums runs yelling “Hey you guys! I want to come too! Not again!! !”), and new jokes. I would definitely recommend for everyone to see this movie. Now, I have one more thing to say about the movie, but it’s a major spoiler. It gives away the entire ending. 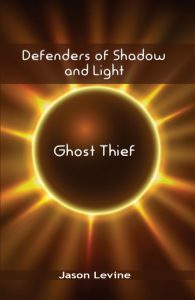 So, if you haven’t seen the movie, stop reading here. Go on out and see the movie and then come back and read the rest. Go on. I can wait. Have you see the movie yet? But they didn’t. They lost. The important thing, though, is that they realized what was important to them. It wasn’t the studio, it was each other. Even without the studio, they would keep performing and stick by each other. No matter what happened, they wouldn’t break up again. And then Gonzo accidentally bonked Tex Richman on the head just before the end credits and they got their studio back anyway. Leave it to Gonzo to employ a Dues Ex Bowling Ball.